Giving new scope to modern living is our Oasis Club Chair, a refined and urban piece of fabulous outdoor furniture from Design Warehouse. Allow yourself to sink into style in this extremely well designed, unique Club Chair, which is part of the versatile and charismatic Oasis Outdoor Collection. A range that inspires comfort and luxury in equal measures, the Oasis Collection radiates opulence, style and panache. 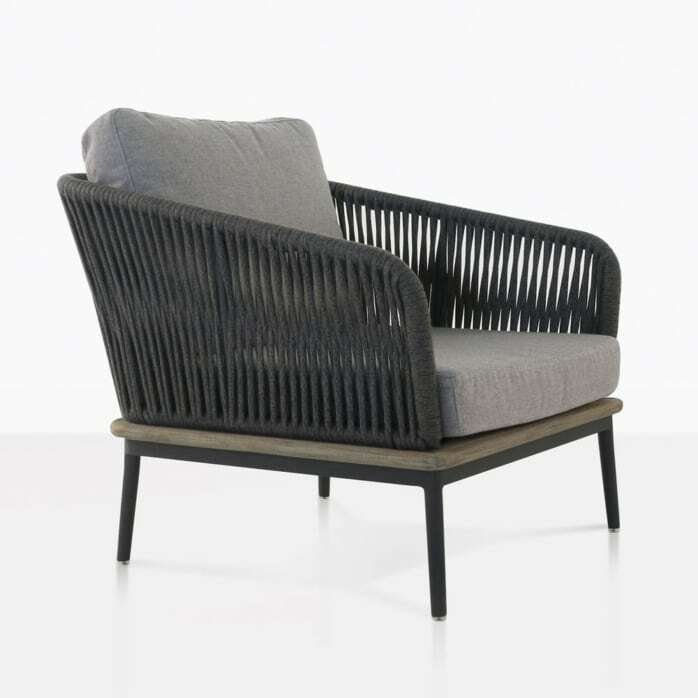 The Oasis Club Chair holds all the qualities of this fantastic series, with a generous display of dark charcoal outdoor rope, wrapped around a stunning powder coated aluminum frame, dressed with gorgeous fog (light grey) Sunbrella® cushions and accented with teak. So as well as looking chic and sophisticated, the Oasis Rope Club Chair has comfort aplenty in its wide, deep seating and rounded back, meaning you can sit back and watch the world go by in the gorgeous setting created by Oasis. Situate the Oasis Club Chair in amongst a grand sectional setting – incorporating the left and right Sofas, Loveseats, and Corners to build a suite that compliments your space and style. Emphasise the contemporary, urban look with chic concrete accessories such as coffee tables and planters filled with your favourite greenery. All you need is your favourite people to come, sit back, and relax in style. 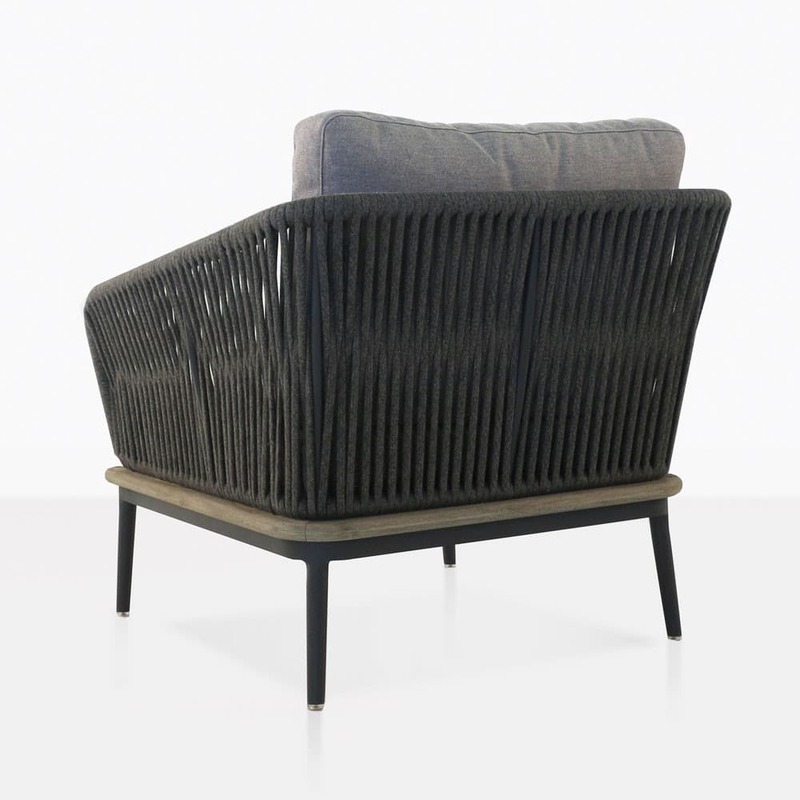 The Oasis Outdoor Club Chair is made using the finest materials for alfresco living. 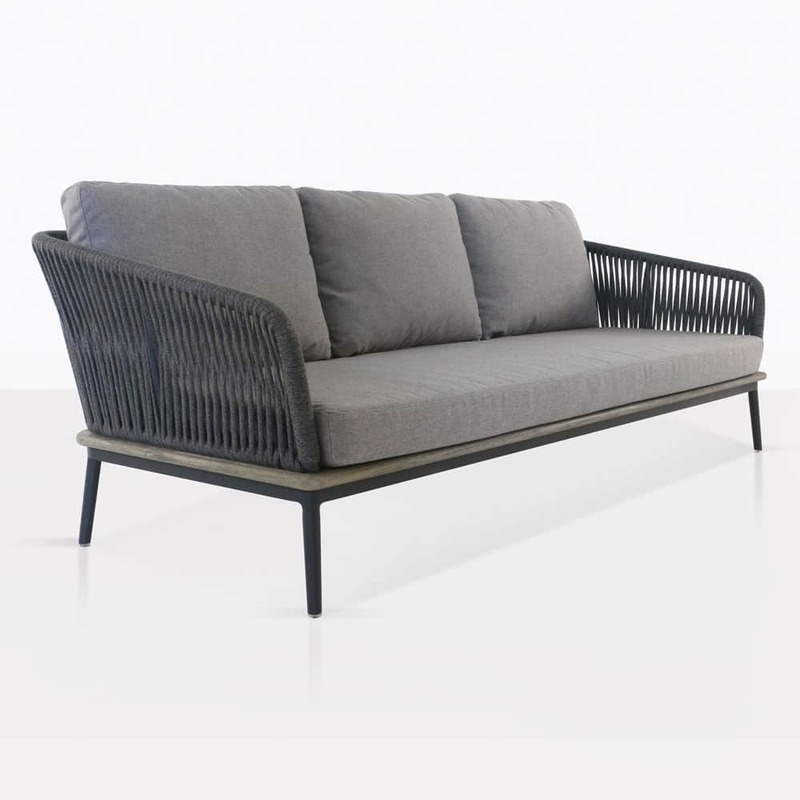 A frame made out of dark charcoal powder coated aluminum looks the part, but also protects from erosion and elemental exposure, wrapped around this strong and sturdy frame is black outdoor rope, which being made from synthetic materials and treated for UV, is extremely robust. A delicate teak accent not only looks wonderful, it also bears the badge of being the most trusted wood for outdoors! 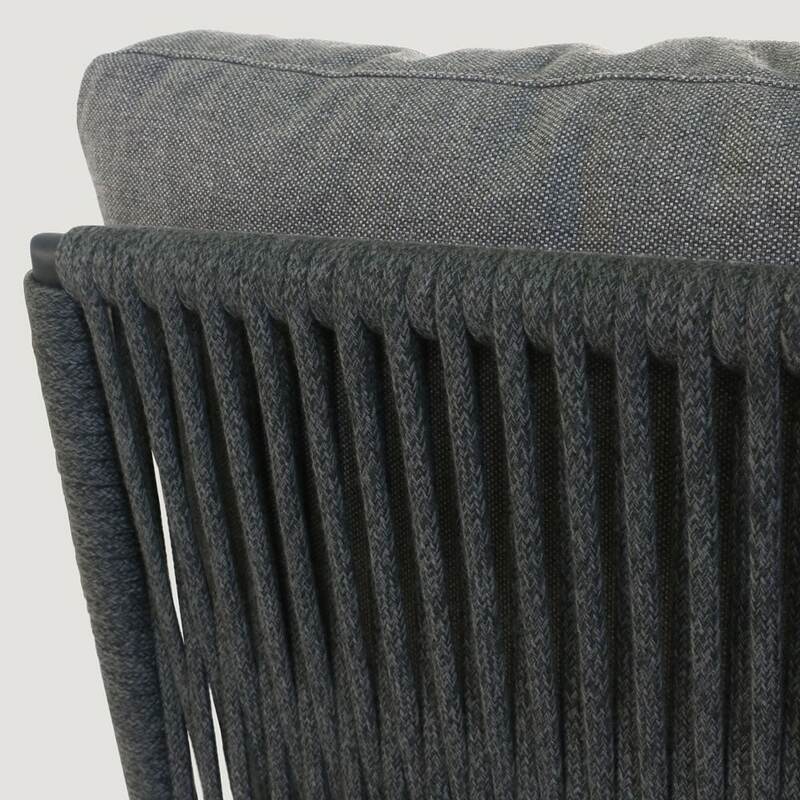 Finally, topped for your comfort are the divine Sunbrella® cushions, which are fade resistant. 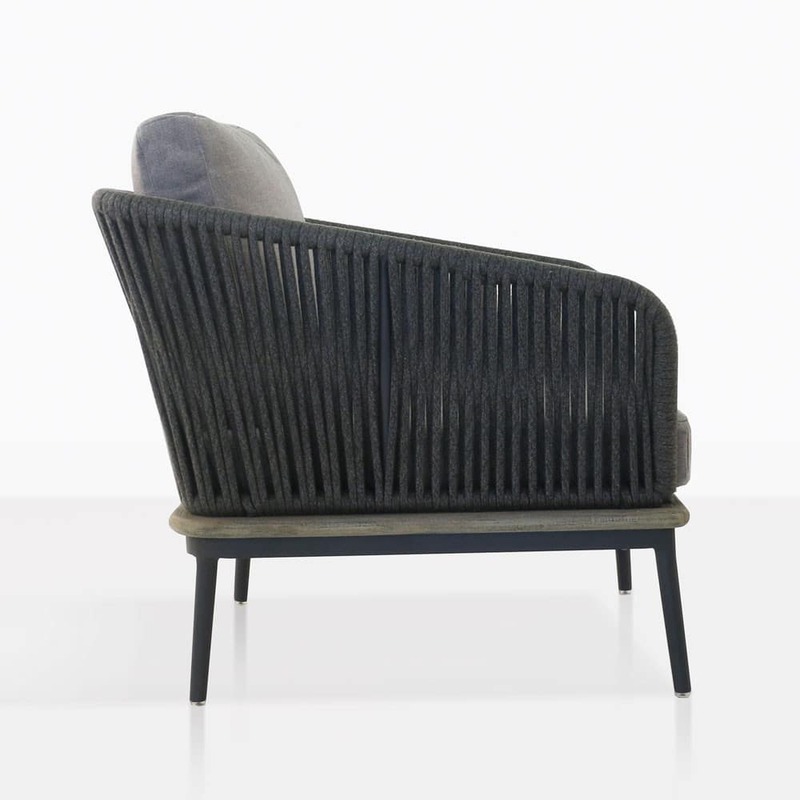 The Oasis Club Chair is a prime example of chic, contemporary outdoor elegance. What are you waiting for? Purchase yours today and experience supreme luxury.